Get off the beaten track with a bicycle tour of the Bali countryside. The ride takes in volcanic landscapes, lush rice paddies, coffee plantations, temples, and opportunities to learn about local culture. 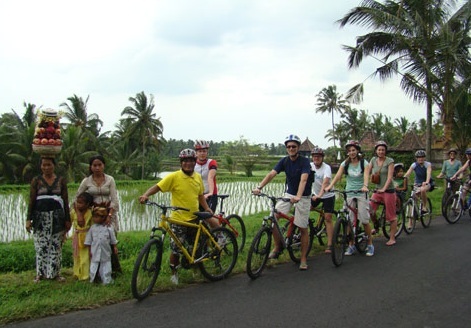 The “Bali Bike Baik Tour” lasts from 8am to 4pm and includes an 8-course Balinese lunch. The tour costs IDR400,000 (USD46) for adults and IDR250,000 (USD29) for children under 12. The tour includes a mountain bike, safety helmet, breakfast, lunch, mineral water during the ride, all entrance fees, an English-speaking guide, and personal insurance. The tour begins at 8:00am with pick-up from your hotel by air-conditioned van. The quoted price of IDR400,000 (USD46) is for pick-up within the Ubud, Kuta and Sanur areas. For pick-up from Nusa Dua, Jimbaran, or Canggu the price will be IDR450,000 (USD52). After the included breakfast, participants will be driven to the top of Mount Batur where they will enjoy beautiful views followed by a leisurely bike ride downhill. The tour will stop at a rice paddy and coffee plantation for an opportunity to learn more about these plants and the harvesting process. Participants will then be welcomed into a Balinese home for an 8-course feast of authentic local cuisine. Vegetarian options are available. Visit http://www.balibike.com/ for more information. This tour can be booked by calling (62) 361 978052 or emailing bikebaik@yahoo.com.